South Korean Government Urges Samsung And LG To Forsake Android: "We Cannot Go On Like This"
When news broke earlier this month that Google had agreed to buy Motorola Mobility, many members of the tech community immediately began wondering just what would come out of the deal. 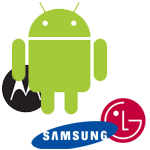 The Android manufacturers LG and Samsung lauded the decision, both proclaiming that they welcomed the acquisition and Google's commitment to defend Android's interests. Evidently, however, the South Korean government has some concern about the purchase and has begun nudging Samsung and LG in an effort to bring them away from Android and toward a "coalition of other South Korean companies," intending to build a new mobile OS developed in South Korea. The Deputy Commerce Minister was quoted as saying "In the long term, we cannot go on like this by solely relying on Google," indicating some fear that - should Google hop into the manufacturing arena - phones made by Motorola Mobility would be treated with more preference, leaving other manufacturers out to dry, as it were. Given the lead Android holds in the global smart phone market (ahem- 53%) it is doubtful that the two South Korean manufacturers would readily abandon the platform in favor of a yet-to-materialize OS. While rumblings earlier today that Samsung was considering buying webOS have been discredited, Android And Me was quick to point out that Samsung still has Bada OS, a potential candidate to replace Android in LG and Samsung's business, should the manufacturing giants choose to follow the government's advice. It is very likely that in the coming months we will see whether the South Korean government's worries are founded, and what Samsung and LG plan to do about it, but for now everything is speculation and Samsung and LG appear to be in harmony with Android for a while to come.